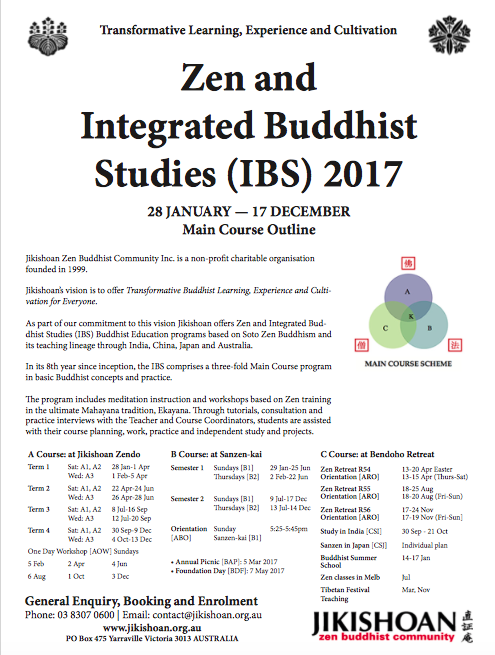 The 2017 IBS Course Outline provides information on Jikishoan’s courses for the coming year. Jikishoan’s vision is to offer Transformative Buddhist Learning, Experience and Cultivation for Everyone. As part of our commitment to this vision Jikishoan offers Zen and Integrated Bud- dhist Studies (IBS) Buddhist Education programs based on Soto Zen Buddhism and its teaching lineage through India, China, Japan and Australia. In its 8th year since inception, the IBS comprises a three-fold Main Course program in basic Buddhist concepts and practice. The program includes meditation instruction and workshops based on Zen training in the ultimate Mahayana tradition, Ekayana. Through tutorials, consultation and practice interviews with the Teacher and Course Coordinators, students are assisted with their course planning, work, practice and independent study and projects.